I was watching the coverage – via the BBC internet replay feed – and conjecture arose among announcers regarding the cut line. One gentleman postured between 5 and 9 over. That’s really sticking your neck out. It turned out to be +6. Played fairly easy. Was that Dana Derouaux working for Shiho? Haven’t seen him in ages since he migrated onto the Japanese tour. Nice ponytail. Listening to the repartee among the BBC announcers is so refreshing compared to their American counterparts. Usually I can’t take more than a few minutes of put-you-to-sleep golf but it kept my interest. I watched all four hours. There are some lessons to be learned here. Loved the interview with Dame Laura. “You can never be scared to fail”. I love the links style courses especially the ones I’ve visited. Good memories. Christina Kim should not wear white. Just saying. According to posts on Twitter, the 1st hole is playing the toughest. That seemed to be the case when I was there working for Kris Tamulis in 2010. First hole is playing the toughest at Birkdale. So far today there have been 4 doubles and a quad on the hole. Played to 4.81 the first day. Been out talking to folks. Just came back to see Lexi Thompson made a 10 on the 1st hole. Bogeyed the 2nd. Tough to bounce back from a 10. Kris had an 11 (or higher, can’t member) in the first round and still made the cut that year. She was all over the news. I take it all back. It was Lytham St. Annes not Birkdale but a great recovery it was. Yesterday I had the itch to hit the road so I took in two Alabama attractions fairly close to each other. 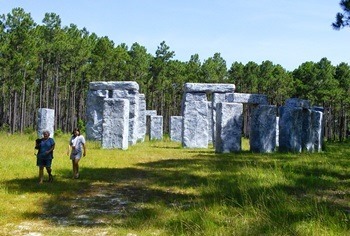 Bamahenge, a replica of Stonehenge set in the woods of Elberta AL, and Fort Morgan, a coastal defense fort built in the 1800’s to protect the entrance to Mobile Bay, where my stops. This entry was posted on Friday, July 11th, 2014 at 3:53 pm and is filed under Uncategorized. You can follow any responses to this entry through the RSS 2.0 feed. You can leave a response, or trackback from your own site. bamahenge, do you get 2 budweisers or PBR when you go there?